We were recommended to The Birth Team by a previous work colleague. Sarah, co-creator of The Birth Team, was a little disillusioned with web designers after a few bad experiences. Dare to Think were there to reassure her that we’re always here to help and will listen and explain in non-techy words exactly what’s to be done with the site. 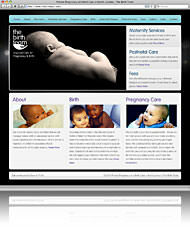 The Birth Team required a website that was simple, clear, informative, enticing and easy to maintain with an added News section. The result is something we’re all proud of and more importantly is proving to be an ongoing success for their business.